Li Wah Lai, a longtime resident of 95 Reade Street in Tribeca, couldn’t take it anymore. 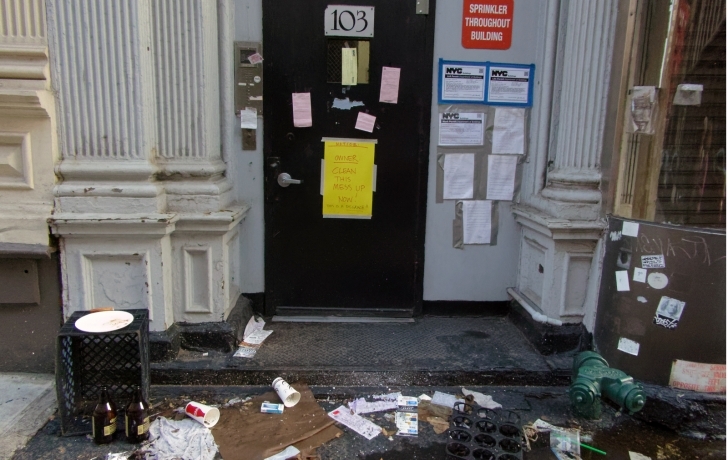 Living a few doors down from the chronically littered front of 103 Reade Street, she registered her anger the best way she knew how. With a sign, taped to the front door. More officially, the city had been trying, also in vain, to get the owner’s attention. Along with Lai’s bright-yellow sign were summonses on the door from the Sanitation and Buildings departments. On July 11, along with an accumulation of sidewalk debris were two large beer bottles and a plastic crate, the same objects apparently cited in a two-week-old Sanitation Department ticket. The building, which was long owned by Ackerman Realty, is being developed by the buyer, Hubb NYC. In a telephone interview on July 11, Hubb’s asset manager, Steve Dluzyn, said he had not been aware of the problem until he was contacted by the Trib. “I have not been down there in a few weeks,” he said. “I appreciate your reaching out to us. “My understanding is that there are people who are sleeping there and I guess people just leaving trash,” he added, saying the company’s cleaning service will now make more frequent visits and the violations will be cured. The next morning, the sidewalk was cleaned. “Inadevertently, the cleaning company only was taking care of the 121 Chambers side, not the 103 Reade side,” Joe Lombardi, the architect on the project, later told the Trib.